Changes Coming For 42nd MILO Marathon | Servinio's Sports Etc. Show of force by officials of Nestle Philippines, Runrio and PATAFA as they launch the 42nd National MILO Marathon. The National MILO Marathon is all set for its 42nd season of discovering the best runners in the Philippines. An expected 150,000 runners are expected to sign up in the country’s most durable and prestigious footrace. The National Finals will be held in Laoag City on December 9 marking the event’s return to Luzon after stops in Iloilo and Cebu the past two years. 2018 is also the 200th anniversary of the founding of the province of Ilocos Norte and the City of Laoag so expect an equally scenic and challenging course that will pass through the areas major historical and tourist attractions. Aside from cash prizes and gifts from sponsors, this year’s MILO Marathon King and Queen will have a shot at representing the country in the 2019 Southeast Asian Games and also compete in another overseas event according to Dr. Philip Ella Juico of the PATAFA. Reigning MILO King Jeorge Andrade of Davao was sent and emerged as the champion in last month’s Borneo Marathon. 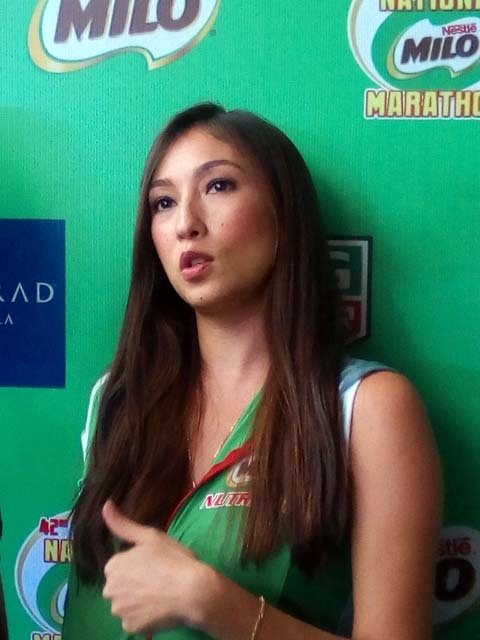 MILO Nutri-Up ambassador Solenn Heussaff models the new finishers’ hoodie. In order to find out who will get to race with Andrade and MILO Queen Mary Joy Tabal, a series of 10 regional qualifying races will be held beginning in Urdaneta City, Pangasinana on July 15 followed by the much-awaited Metro Manila race at the SM Mall of Asia on July 29. For a change, runners will be negotiating a totally new route as the race will not traverse Roxas Boulevard anymore upon advise of the MMDA and instead stretch further down Bayani Road in Fort Bonifacio. Succeeding races will be hosted by the cities of Tarlac (August 25), Batangas (September 16), Lucena (September 30), Iloilo (October 7), Cebu (October 14), General Santos (October 21), Butuan (November 11) and Cagayan de Oro (November 18). The earlier than usual announcement will accord runners more time to prepare especially for the longer distances. Instead of the traditional shirt and towel, all finishers of 42 and 21 kilometers within the cut-off time will be rewarded with a training hoodie plus a medal and loot bag. Onsite registration is ongoing at Landmark branches in Makati, Trinoma and Alabang while online registration and more information may be found at www.milo.com.ph and www.runrio.com. 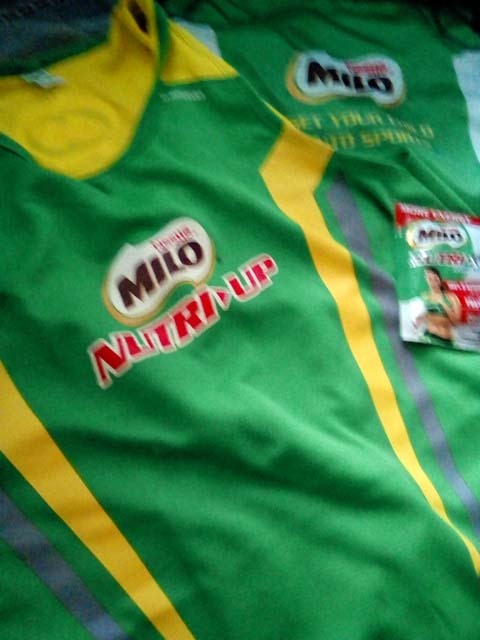 Official 42-kilometer singlet with drawstring bag and a sachet of MILO Nutri-Up for Adults. The MILO Marathon will also continue its advocacy of providing free rubber shoes to poor but deserving public school children in the host cities in coordination with the Department of Education. This year, MILO will also be donating basketballs in order to involve more children in sports as they seek to build champions not just in sports but also in life. This entry was posted in Marathon, Running, Sports. Bookmark the permalink.